A couple facing a two-year prison sentence for forcing some of their 11 adopted special-needs children to sleep in cages hope to get the children back. Michael and Sharen Gravelle were sentenced in February on four felony child endangering charges and seven misdemeanors. The couple are free on bond pending appeal. "We still have an inside shot at getting our children back, which was our goal and we still stand by that," Michael Gravelle said Wednesday in the couple's first public comments since they were sentenced. The Gravelles' children, who ranged in age from 1 to 14, suffered from problems such as fetal alcohol syndrome and a disorder that involves eating nonfood items. 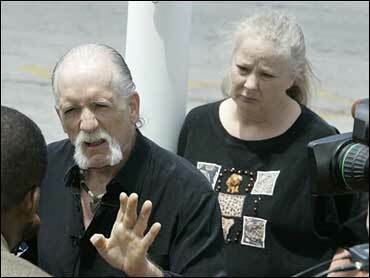 Authorities removed them in September 2005 from their home in Wakeman, about 60 miles west of Cleveland. The children were placed in foster care in fall 2005. Sharen Gravelle said she thinks often about the children who the couple said they took in because no one else wanted to do so. "I didn't even get a chance to say goodbye," she said. The chance of the couple getting the children back appears remote. About three weeks ago, the Ohio Supreme Court refused to consider an appeal of the custody case that put the children into foster care. Michael Gravelle repeated his past comments that he and his wife made enclosed beds for the safety of the troubled children they adopted. "They built a case on a lie, 11 kids locked in cages," he said. "It was not true." A jury heard evidence, including testimony from the children, that the Gravelles put them, sometimes for punishment, in small wood-and-wire enclosures. The Gravelles are out of money for the legal battle and are hopeful they will receive financial support to fight what they say is an unfair conviction. They say they are working part-time jobs and have tried without success to sell the house where Michael Gravelle built what prosecutors called cages in the upstairs bedrooms. Auctioneer Steven Kraus said he is planning an auction July 20 aimed at raising $50,000 for the Gravelles and is seeking donations of items and cash contributions. He believes in the couple's innocence.